In 1900 Rev. John Pugh of the Presbyterian Church of Wales built a hall alongside Whitchurch Road in Heath. It was one of many that set up as part of the Forward Movement to reach out with the Christian Gospel to people in the rapidly growing areas of Wales at that time. The development of housing was bringing many people into the Heath district but there were no places of worship until the hall was opened. 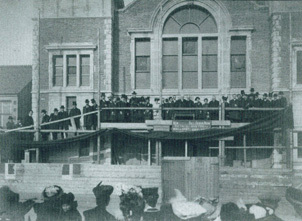 At first the services were led by evangelists and missioners of the “Forward Movement” and in 1901 the first eighteen members of the church were enrolled. 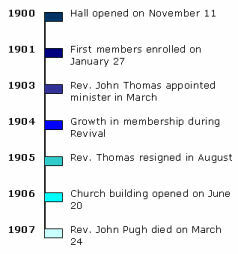 The first pastor of the church was appointed in 1903 when Rev. John Thomas of Acrefair, Wrexham came to Cardiff to assist in the Forward Movement. Under his ministry the church was well-organised and soundly established, and during the Revival of 1904-05 the membership rose to over sixty. Plans for a larger church building were made, although Rev. Thomas had left to work full-time in the Forward Movement by the time it opened in 1906.